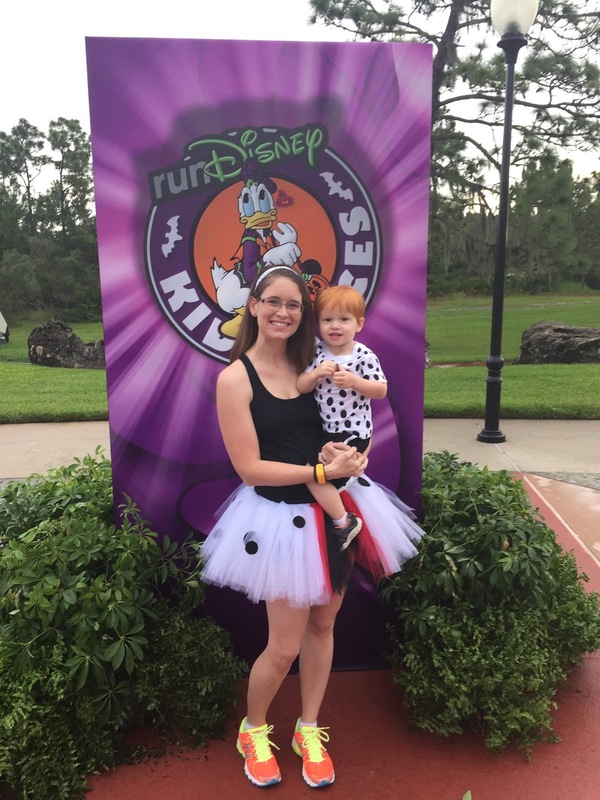 A few weeks ago I posted a picture of a Cruella tutu and two dalmatian spotted shirts that we were going to wear in the runDisney Tower of Terror 10 Miler race weekend at Disney World. Day 2 of our trip was race day, for all of us. It started in the morning with the Kids Races. 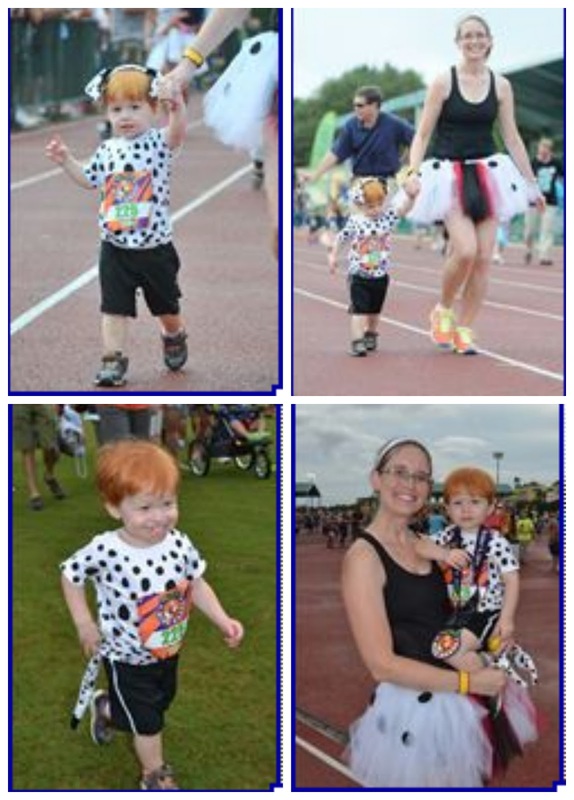 Perry, Ben and Kate all ran in their respective races (a 100m, 200m, and a 400m dash). 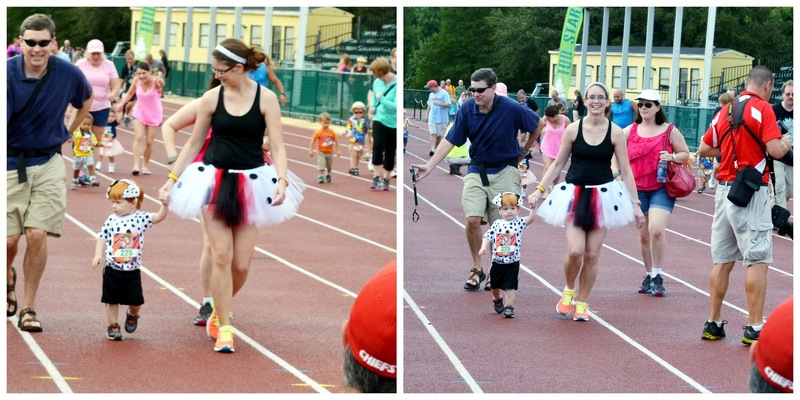 I donned my Cruella tutu for the morning so I could run with my littlest dalmatian in his race. I think I was the only parent dressed up, but that was ok. 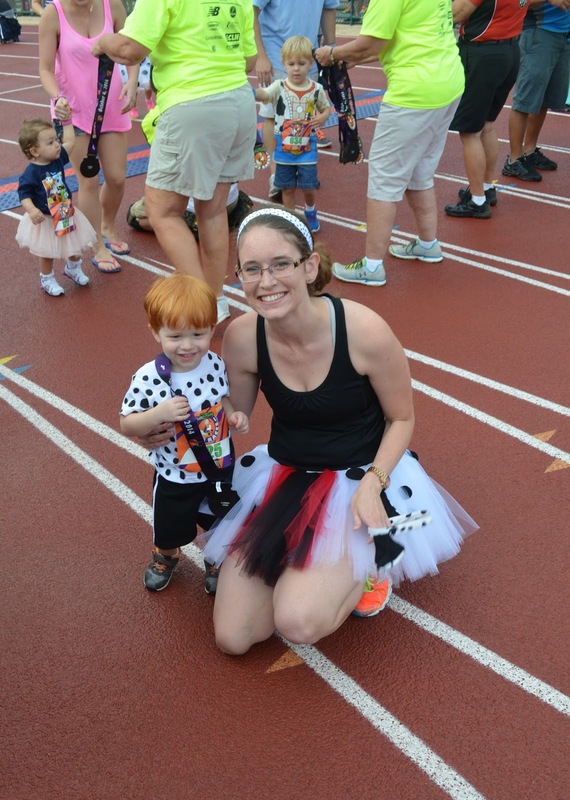 The tutu would appear again later with a bigger dalmatian running partner for the 10 miler race. 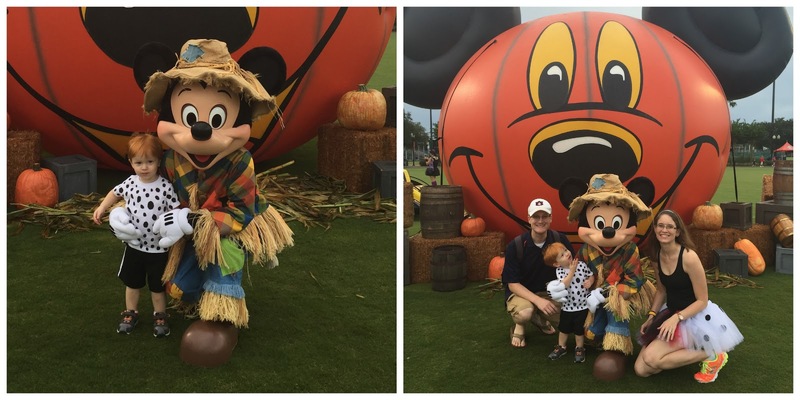 When we got to ESPN that morning, Mickey Mouse was out in his best scarecrow wear so we went and met him. This was Perry's first real character meeting of the trip and he walked right up and did great. 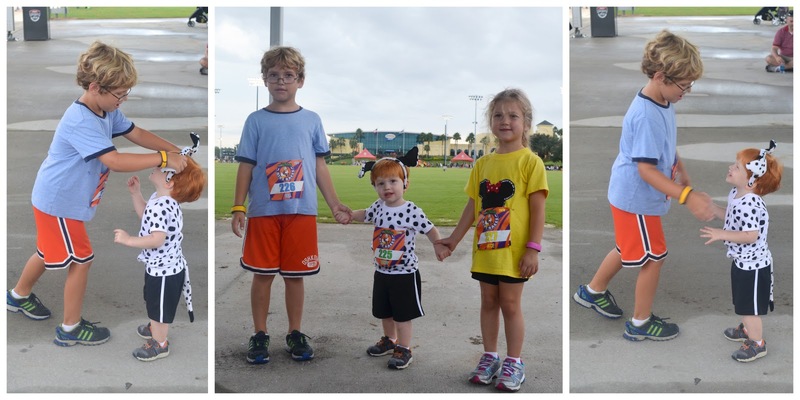 Then we went down to the track where the kids races were being held and hung out there for a while. We knew it would be an uphill battle to keep those puppy dog ears on Perry's head. And it was...until big cousin Ben decided they were cool and wore them...then Perry loved them and put them on. Oh the power of peer pressure. Perry things his cousins are the best. 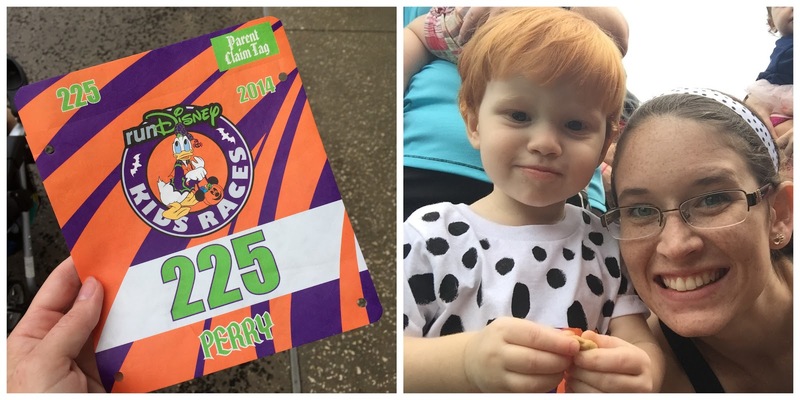 Perry did awesome in his race. He ran the whole 100m holding my hand and kept his ears on his head. 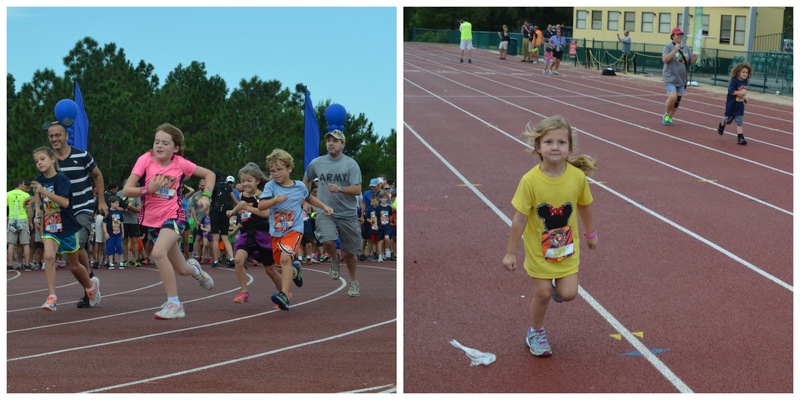 They were great about only sending a handful of the little ones at a time so they had room to run at their own pace. Daddy and a medal were waiting for him at the finish line. After Perry ran his race we stayed and cheered Ben and Kate on in their races. They did awesome. Before we went our separate ways for the afternoon, we had to get a picture of the three cousins in their medals. Perry's is pretty much the size of him. It was such a fun morning down at ESPN. We still had a nice relaxing afternoon at the resort to look forward to, and a super yummy lunch, before an even bigger runDisney evening. 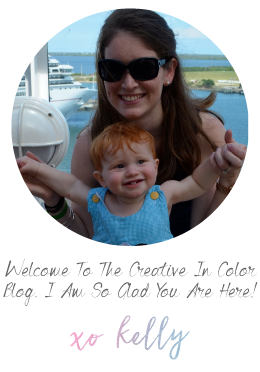 But I think I will stop there with this blog post....because it is past midnight and time for bed.